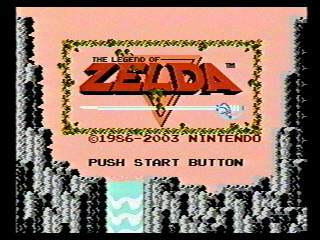 Released in July 1987, The Legend of Zelda introduced gamers to a young boy in green who would form the basis for another classic Nintendo series. In this game, he must recover the eight pieces of the Triforce of Wisdom, so he can confront Ganon for the Triforce of Power. Best Single-segment Time: 0:29:56 by 'LackAttack24' on 2015-03-31. Best Single-segment Time with Second Quest: 0:36:45 by 'Darkwing Duck' on 2014-01-20. All information on techniques, kill counters, drop table, etc. for this game can be found at http://redcandle.us/The_Legend_of_Zelda. The any% route used for this run requires random drops at certain points, bomb and rupee management, knowledge of the drop table, and adjusting to different enemy patterns. Standard beginning and got a random bomb from the first red darknut. This bomb drop has become the reset point for the run, and will most likely reset if a bomb is not dropped. Was able to get a 5-rupee drop in the vire room and then got a favorable "breakfast room" pattern. Vires and Gleeok went down without an issue, was fortunate to get a fairy drop from Gleeok to save 2 seconds on the health refill. I developed a new strategy of killing a different number of stalfos depending on number of bombs/rupees going into 1. With 14 rupees and 6 bombs, my main concern is rupee drops. Because I got a random fairy from Gleeok, I know that I am at 2 or 5 in the kill counter leaving dungeon 4. I killed 2 octoroks on the way to 1 in order to be at 5 or 8 in the counter. This allows me to get a random 5 rupee drop on the 2nd or 5th kill of a rupee enemy group. I got a 5 rupee in the stalfos room on the 2nd kill, confirming I was at 8. In the 2nd stalfos room, I got the best pattern you could hope for, clearing 4 stalfos with a bomb, opening the door, and killing the last one with my sword at the same time. I pick up the forced bomb, and now have 20 rupees in great shape. I killed all 5 gels which is bad practice because it changes the goriya spawns in the boomerang room. No issues getting the bow, and kill a couple keese to get over 10 in the consecutive counter, which allows for a 5-rupee drop on Aquamentus. I get hit right away out of 1, but rally to get a forced 5 rupee to reach the minimum of 30 rupees to buy the candle. I was only at 2 in the consecutive counter entering 5, which is low. The 2nd room of gibdos do not cooperate, but make it through without getting hit. After the basement, I'm at 6 entering the blue darknut room. I get hit immediately, but still manage to clear the room with 5 bombs and 4 sword slashes. With no extra bombs, I have to kill the gibdos with the wooden sword, 14 hits in all. I do get a good pattern though, but do not get a bomb drop. The run now can end on Dodongo's pattern, but he walks into the bomb, netting me the important bomb drop. The rest of the dungeon goes smoothly. Another important overworld section with tricky screen scrolls. Since I am low on bombs, I cannot miss the bomb cave or I will lose 3 seconds to a menu transition. Low bombs entering 2 also mean I need a bomb drop to kill the Moldorm quickly. The red Goriyas do not drop a bomb so I have to kill the Moldorms and Red Goriyas by sword, which is a considerable time loss. I only have 1 bomb to smoke Dodongo, but was able to place it in the correct place and have full bombs and rupees entering 7. The first 2 goriya rooms are all about survive and advance. The critical Goriya/Keese room goes well after a rough start, but I don't have beam sword. No random bombs again through the rest of the dungeon. The wallmasters leave me alone, and Aquamentus goes down easy as usual. At this point, I need 2 (maybe 3) bomb drops to finish the game. I had set myself up poorly for a random bomb, and got forced fairies in the first wizzrobe room. I had some trouble in the Wizzrobe/Like-Like (I call it the Magic Pan Room) room and lost all gainable time in 6. In the 2nd Magic Pan room, I developed using the arrows in that room to speed up the killing of the Like-Likes if I am hit by a bubble. I'm still a bomb drop short leaving 6, but have several chances before 9. The first blue darknut room is very fast even though I take a couple of hits. I get my random bomb from the Gibdo in the next room, and can 'rest easy'. The 2nd blue darknut room does not go well. Gleeok goes down with Link only taking a couple of hits. I have a big life refill, but am well within reach heading into 9. The true magic of the run. The Zol/LikeLike room strat has evolved to standing on the ladder so that the bubble cannot hit me. I clear that room, but take the hit on the bubble to reset my consecutive counter. After 4 keese and 5 Like-Likes, I am set up for the bomb drop. The first Patra skip is executed. I get my bomb drop in the Wizzrobe room, and clear the rest of the room, taking a hit in the process. The difficulty of rooms is extremely high now, needing a perfect execution of a block clip, and also a cooperative Patra pattern to complete. All of that happens and head to the reverse C room. With 6 bombs, I have 3 to use on the Wizzrobes. I actually misplaced the bombs because I was on the half-step, only hitting one on the 3rd bomb. I luckily get a bomb drop from the last red Wizzrobe and get the arrows. Reverse block clip done. Recently, I discovered that you could walk through the 2nd Patra without getting hit, but it was a very low probability. I was having success about 5% of the time. Normal scenario include getting hit once, sometimes twice (depending on the pattern). However, I did perfect movement and Patra moved the right way, allowing Link to get through unharmed. This was very important with only 6.5 hearts left. The last Wizzrobe room goes well with 3 bombs to spare. I get the good spawn from the Wizzrobes in the trap room, and execute the final block clip. Patra 3 doesn't pose an issue. Perfect Gannon despite getting hit by a fireball. 29:56. Overview: The run was amazing from start to finish. I had minimum bomb counts from the Recorder to the end of the game, and got lucky drops several times to help this run to continue. Knowledge of the drop table made this run possible because of bomb drop chances. My total life refill for the run was 16 hearts (a good number), which adds 16 seconds to the run. This is easily my greatest gaming accomplishment. Thank you to the Zelda 1 community for all of the tutorials, coaching, and support. I have no plans to continue lowering this time, but this run can be beaten with current route and strategies. Good luck, we're all counting on you. All Zelda runs will now contain the screen scroll glitch, so I think I'll start the comments there. To clip through a wall (screen scroll glitch), you must stand toward that wall and be a specific amount of pixels away from the wall (either 5 or 7, the amount escapes me at the moment) and then move one frame in a side direction. This will cause Link to turn around, but stay on the same pixel. Then you can move through the wall. You only get to move through a half step of solid wall, but that's enough to clip through things that are set diagonally, or push you through the screen transition "wall." Clipping through the edge of the screen sends you to the other side, which has a bunch of uses you see in the run. Clipping through blocks can be buffered with the sword or an action item. With screen scrolling, the route for this quest is significantly different than a non screen scroll run (which is unlike the first quest, where the route remains pretty much the same). The power bracelet is required in the second quest, and generally you need to go through the lost woods in order to get it, since the ladder is in the graveyard. However, I get get to the west side of the continent much earlier, and thus get the power bracelet early. Proficiency in screen scrolling is the first key to a good speedrun. The route hasn't changed from the previous run. I just perform it a bit better. The biggest change that comes to mind is trying to manipulate a clock in the darknut/bubble room in level 4. I can tell where I am in the kill counter during the eight wall masters. Then there are six forced goriyas afterward and eight more forced kills in level 4 before the darknut room (two zols and three keese for a key and three bits from the broken digdogger). The keese in level 3 and tektites in the overworld are the enemies to kill to setup being at the right number entering that darknut room. Unfortunately, I don't get the drop in this run. Maybe next time. Run starts off well. 12 rupees and 4 bombs is solid leaving the dungeon. The early game is heavily bomb dependent, so there are lots of bomb drops I need to force. Level 2 goes well enough. My 37:11 had an extremely good level 2, so I usually lose a little time here. Being within 10 seconds is good after level 2. I'm 12 behind after this dungeon. Can pick up lots of time after ward, though. The second quest forces backtracking in any route you choose, so I choose to get the ladder. Had a really good key grab in level 6, as well. The world clip is fun to do. It's the reason getting the ladder is so much faster. Still a quick way to get to level 3 and lets you get a heart container as well. Dodongos in level 3 were not great, neither was the first enemy clock from the wallmaster. As good as my level 2 was in my previous run, my level 4 was just as bad. Lots of time was picked up here. Faster room clears is the biggest reason. Okay dodongo room in level 4. Then got a clock in the raft room, which is really helpful. Level 8 was a bit inefficient in my previous run. Even with fairly uncooperative dodongos, I pick up time. Picking up the 100 secret was actually a bit of a chore given the spawn pattern that shows up. Did it well in this run. Fire from the side is best, and I didn't get hit by the moblin. Hardest room in second quest in my opinion is the spiral block blue wizzrobe room. I don't do it in the absolute fastest way possible since they didn't move properly, but I didn't get hit, which was important. Probably the biggest mistake in the run was not one rounding the gohma in level 5. Six seconds were given away, there. Also had the costliest damage boost ever. Despite that, the gauntlet section of level 5 was pretty clean. The room with the key was the biggest routing improvement. Very good gleeok as well. Level 7 is the hardest dungeon to speed through. Was better this go around than before. Ideal manhandla. First darknut room was good. Didn't one round gohma like I should, though. Had a great plan for the second darknut room, but they didn't cooperate. Fairly average. Last darknut room was solid. Good gleeok. Picked up time here, as well. Was well ahead of 37:11 pace at this point. Had a menu issue in level 6. Great clip, however, to grab the key. That, and a one round gohma added time to my lead. Went really conservative in level 9. I was actually kind of forced to do that anyway due to the patterns in 9. With the bomb dropping in the wizzrobe room, I should have used some in that room. Mistake on my part. Losing health forced me to turtle a little bit against the lanmolas. I usually don't go to arrow, there. Losing that amount of time getting my sword was unfortunate, but kind of refocused me. A lot of level 9 rooms are tricky. They look easy, but you need to move in a specific manner to make it look easy. I was asking for a fairy against that last patra and was granted one. A 1/10 chance if the patra dropped anything, around a 5/16 chance. Perfect Gannon to finish, which is nice. Easier to do in second quest than first quest. Still have to deal with the luck factor of Gannon moving to the bottom left instead of the bottom right. Solid run. Can pick up 15-20 seconds in level 9 alone. Rest of the run harder to pick up time.